The Under Armour global store development, asset protection, and store maintenance teams worked closely with InstaKey’s program development team to create and execute a rollout strategy that would generate the least impact on stores with the greatest efficiency for the conversion. Each team clearly knew its role in the conversion process and worked diligently to achieve the end goal in mind: to keep it simple for the stores. 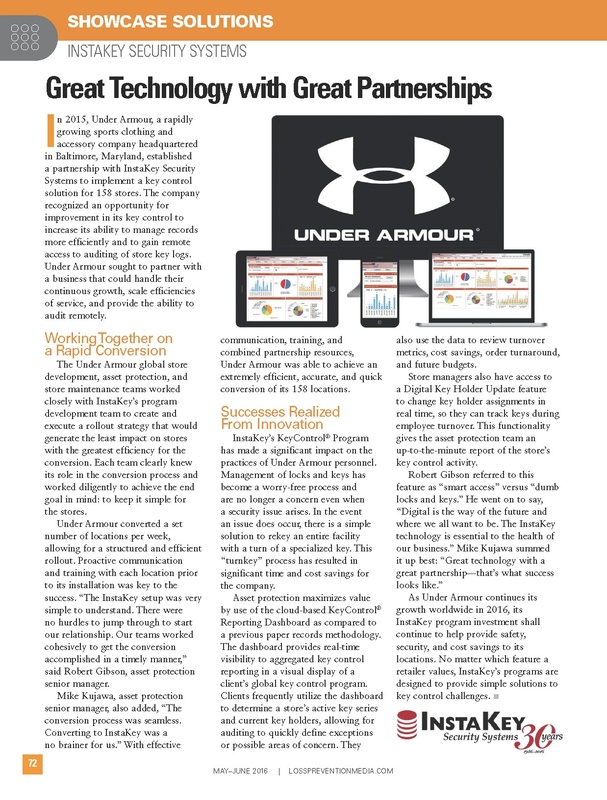 InstaKey’s KeyControl® Program has made a significant impact on the practices of Under Armour personnel. Management of locks and keys has become a worry-free process and are no longer a concern even when a security issue arises. In the event an issue does occur, there is a simple solution to rekey an entire facility with a turn of a specialized key. This “turnkey” process has resulted in significant time and cost savings for the company. As Under Armour continues its growth worldwide in 2016, its InstaKey program investment shall continue to help provide safety, security, and cost savings to its locations. No matter which feature a retailer values, InstaKey’s programs are designed to provide simple solutions to key control challenges.